Delicious buffet with appetizers, vegetables and appetizers. 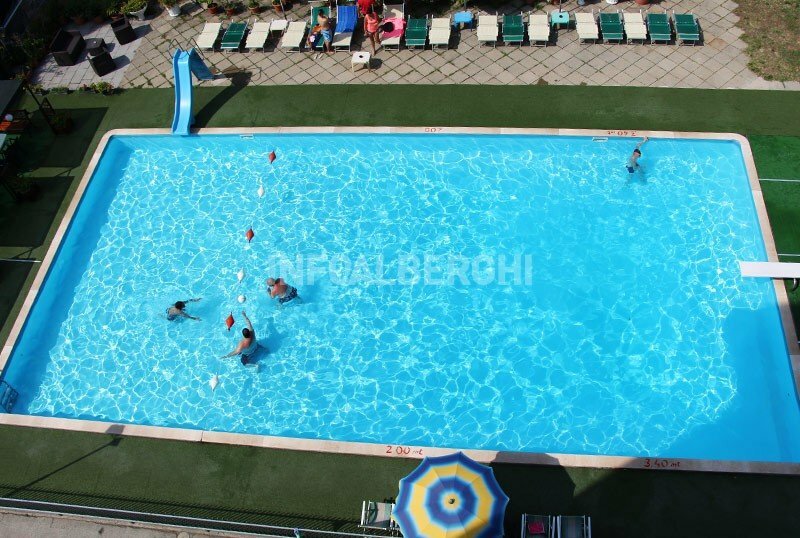 The Hotel Lem , 2 stars in Rimini in a central position, has a large outdoor swimming pool with shallow children area and equipped solarium area. It has parking, elevator, rooms with balcony and facilities for children. Accept small and medium-sized animals. It is located in Rimini in the Marina Centro area, less than 5 minutes walk from the beach. The Lungomare is served by the bus line n. 11 which connects the area to the historic center of Rimini, to the railway station and to Riccione. The rooms have a balcony (some with sea view), private bathroom with shower, telephone, digital terrestrial TV, WI-FI, safe. On request: minibar and hairdryer. Swimming pool with children's area, solarium with sun beds and beach umbrella, garden, open-air porch, free bicycles, terrace with bar, TV room, reading room with newspapers in consultation, lift, welcome drink, laundry service on request. PARKING: uncovered and internal, subject to availability. WI-FI: optical fiber throughout the structure. LUNCH AND DINNER: local cuisine with 3 choice menu, vegetable buffet, pasta and homemade desserts. Water, wine and soft drinks at meals. VARIATIONS: on request kitchen for vegans and vegetarians. In the hotel: children's pool (depth 80 cm), entertainment, outdoor playground area, strollers. On request: baby sitter and pediatrician. At meals: kitchenette for mothers (except in August), baby food, seats for the table. On request: baby menu, bottle warmer. 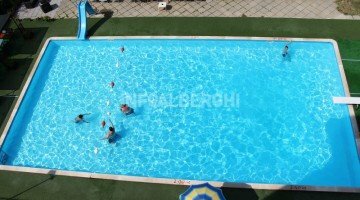 The hotel has a large outdoor swimming pool (20x10 meters) of depths from 1 to 3 m, with a trampoline and a 80 cm deep children's area, surrounded by a solarium area equipped with sun loungers and parasols. The hotel has an agreement with the Bagni n. 66-67, where guests find private cabins, playgrounds and services for children. The prices of the price list are per person per day full board. Weekly package prices are per person per week in All Inclusive. TOURIST TAX: excluded, € 0.70 per day for a maximum of 7 consecutive days (excluding children under 14).